The last Alpha release of Lord of Dwarves was very playable. Most of the game features are in, however there is still a lot of work to be done balancing the game and making sure the pacing feels fun and challenging. For the last two months I’ve been working on some of these balance & pacing issues. Below I will talk about a few specific gameplay aspects that were not working and how I’m changing them to make the game feel just right. Originally dwarves had 16 skills they could level up. This large number of skills encouraged the player specialize their dwarves in the wide variety of skills but then punished them when they wanted to focus many dwarves on a task that required only one of those skills. 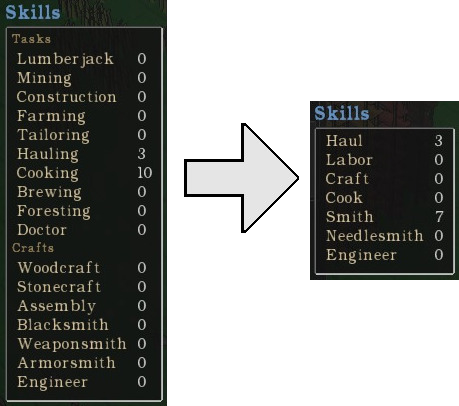 As a result I reduced the number of skills to 7: Hauling, Labor, Crafting, Cooking, Smithing, Needlesmithing, and Engineering. Now the player can have their dwarves focus on collecting wood one day, mining deep the next day, and building a castle on the third. These are all jobs that laborers excel at so they can switch between them while still benefiting from their labor skill value. As a bonus, 7 skills are much more approachable than 16. This is an issue I’m still wrestling with but I’ve come up with a system that I’m liking more and more. Previously I created a novel wound system where wounds would be applied to individual body parts in 3 severity levels: minor, severe, and grievous. There was nothing wrong with how this system worked it was just more detailed than it needed to be. From the players perspective they just needed to manage doctors and make sure they had enough bandages. The actual wounds were mostly irrelevant. The small benefit of flavor to know that Stouthammer got a leg wound from a goblin just didn’t fit the pacing of the rest of the game. So I decided to switch to a modified health points system. Now the player can focus on the supply chain for fixing wounds without having to worry about individual wounds. Although less novel a health points system is simple, immediately understandable, and frankly, fun. Previously if the player wanted more dwarves to join their kingdom they needed to craft beds to accommodate the extra population. Low tier beds could only increase population so much before the player had to collect rare materials for higher tier beds. This system was novel and granted a good progression feeling. However it allowed for no diversion in gameplay as it forced the player into making a ton of beds every single game. I have since replaced the bed system with a Renown system. The dwarven kingdom has a renown value based on the value of various things in the kingdom. The player can actively increase their renown in a number of ways. 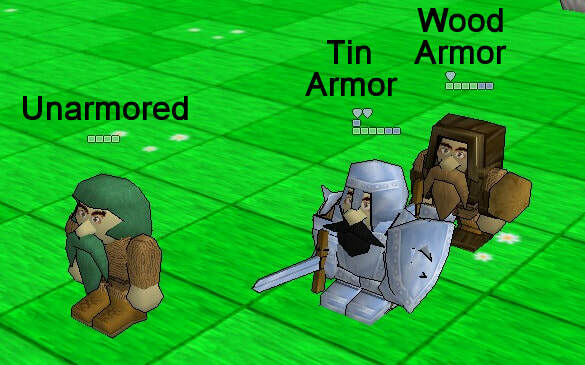 Crafting items (chairs, armor, statues, etc), building structures, and domesticating animals all increase renown, which in turn increases the population. Now the population will increase no matter where the player focuses their attention. Focusing on combat and building arms & armor will increase renown. Likewise avoiding combat and focusing on building structures will also increase renown. As long is your kingdom is growing in some way your population will too. Now the player can try a different play style every game and still progress. Monsters now drop loot! Well to be fair they dropped weapons & armor before, but now they also drop coins, meat, and the occasional rare item. Previously killing monsters didn’t have much of a benefit – except you know preventing civilians from being murdered. Now the coins gathered from monsters can be used to purchase items from markets. Or they can be kept in a vault underground for the boost to renown that they provide! Additionally the player may want to attract more monsters for a chance at rare loot. Building great structures is a very important part of the Lord of Dwarves feel. In addition to looking cool these structures are functional as they hinder and slow invaders from getting to the dwarves. But building them was always too slow. 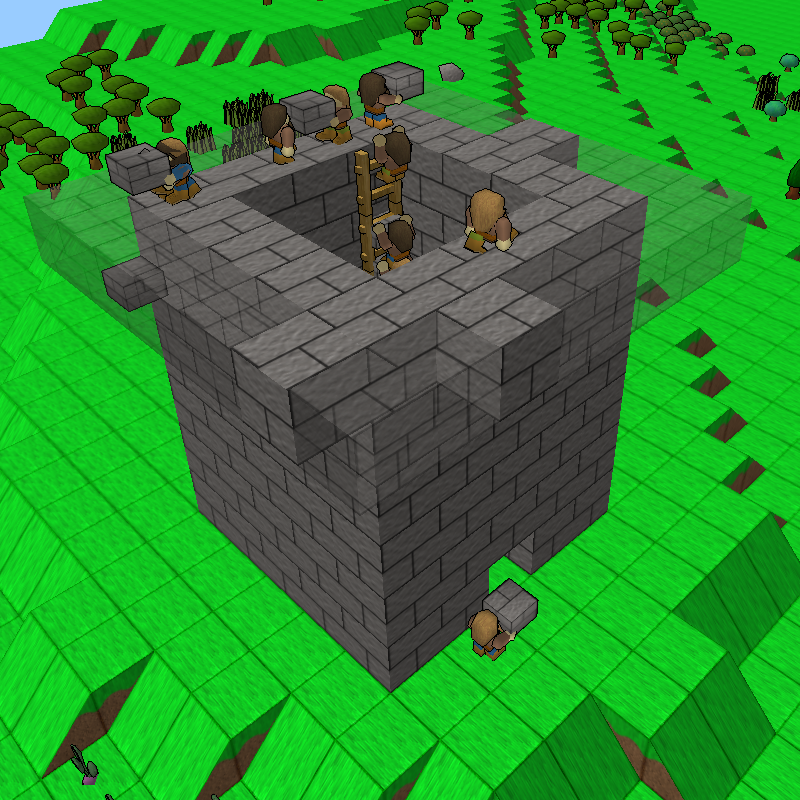 To build a tall wall dwarves need a boost to get up to the high blocks. 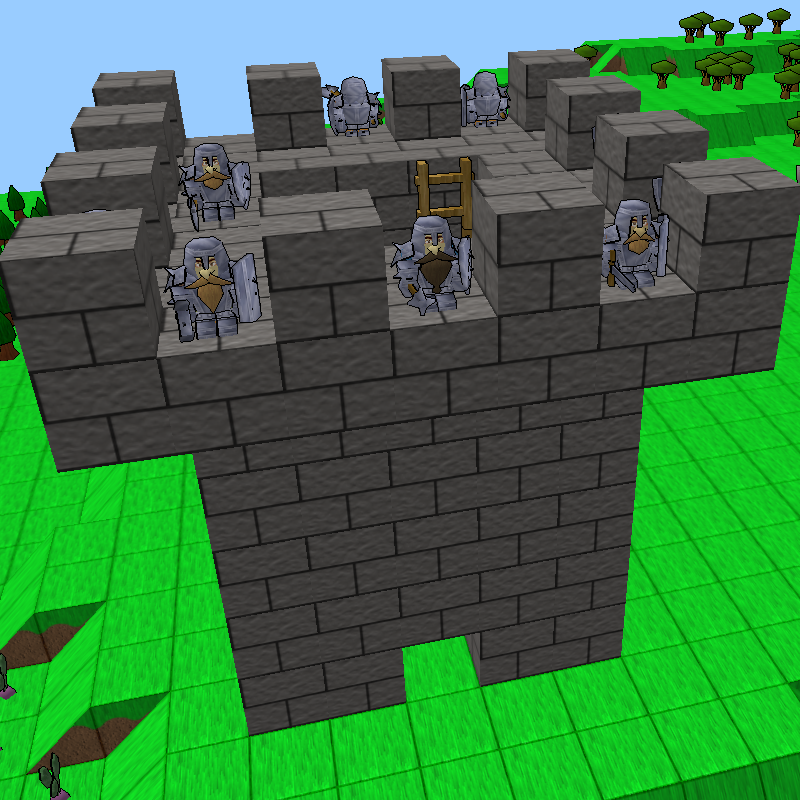 This boost is provided by scaffolding that the dwarves can set up. But if the wall is 10 blocks tall by 10 blocks wide that’s 100 scaffolding that needs to be crafted and individually placed next to the wall. It took forever! 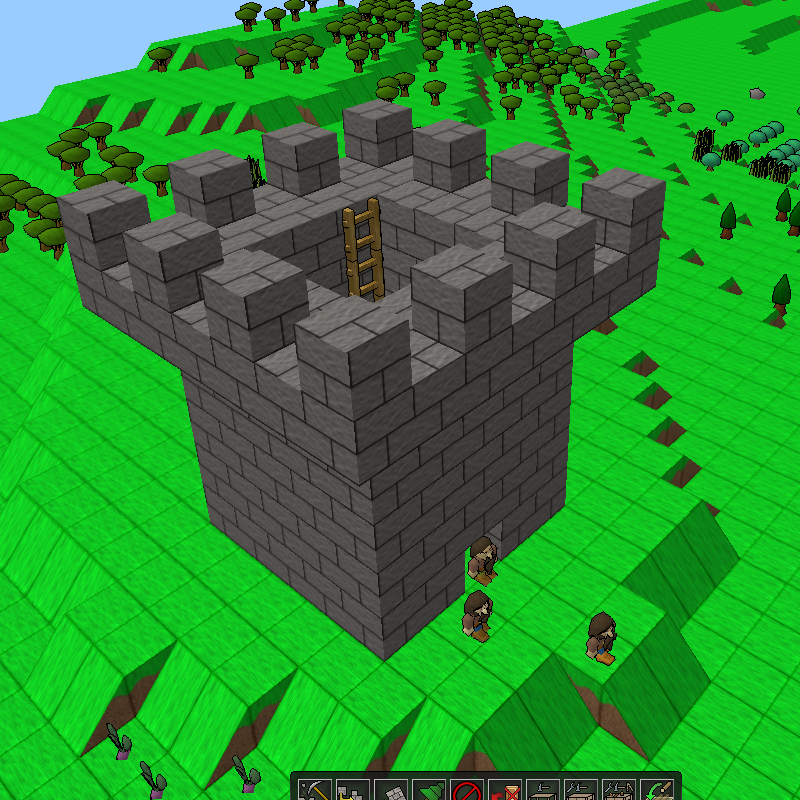 I’ve recently improved scaffolding so that when a dwarf emplaces it, it creates scaffolding three blocks tall. Now only one third the scaffolding is needed. Additionally better quality scaffolding covers more blocks, up to 9 blocks tall. In this way the dwarves can quickly cover a wall in scaffolding allowing them to build a wall in a much more enjoyable time frame. In Lord of Dwarves the player harvests resources, collects them, and then uses them in their crafts. Collecting those resources could be very time consuming. If felling a forest generated 100 logs, each of those logs would need to be fetched by a dwarf and brought to a storage area. After about a year of gameplay the player would often have 2000 or more backlogged items waiting to be gathered. A elegant fix to this was to allow dwarves to carry multiple items at once. 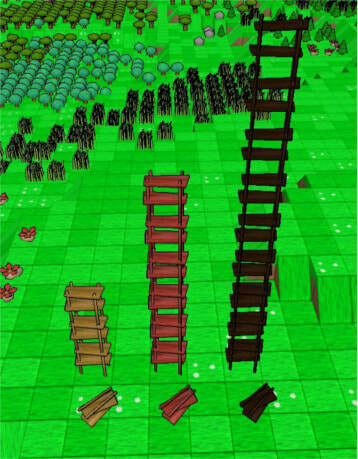 Now a single dwarf can go out to the forest, pick up three logs, and bring them back nearly tripling their efficiency. Additionally as dwarves get stronger they can carry more and more requiring fewer and fewer dwarves to do the same job. This change has greatly increased the players ability to maintain a clean kingdom and an efficient production chain. Those are some of the major systems I’ve been working the last few months. There are numerous minor systems I’ve also been improving like roads, storage priority, soldier uniform efficiency, and even multi threading the path-finding code. Lord of Dwarves is a big game and I’m trying to get the feel just right before I release it. Wish me luck! I always want to work and work to make my game better but sometimes I forget I need to show people all the work I've done! I started on this game in 2013 and (pause to run my line count program) have created 296,756 lines of code. Thats over 10 million characters (yes I've changed keyboards).One of the most amusing things about creating a program so large is that the game systems start to interact in surprising ways. 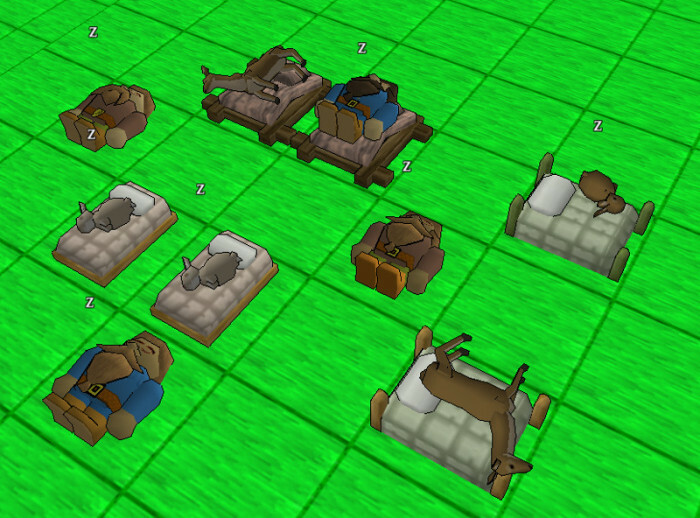 Back when I added beds to the game I programmed the dwarves to find and sleep on them instead of the ground. I didn't realize at the time that the animals AI still used some of the dwarf AI code. I ended up with the situation below. 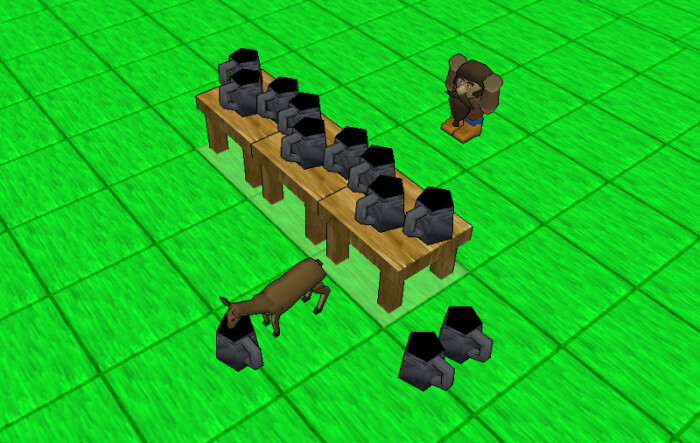 Suffice to say my dwarves were waking up with stiff backs while the animals were getting well rested bonuses.Another time I taught the animal AI to find and eat the dwarves' crops. 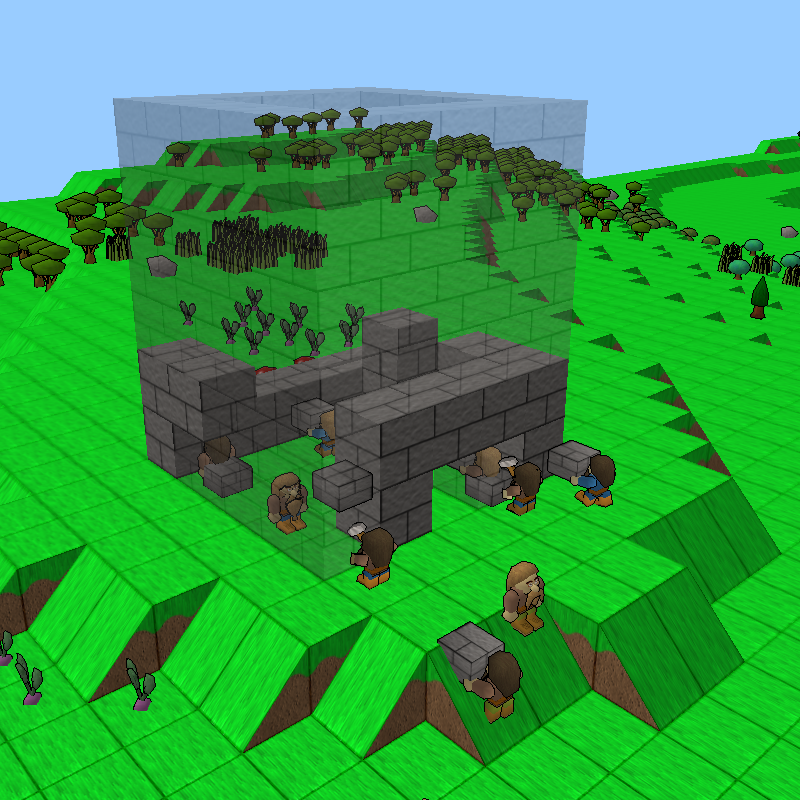 The idea is that the player must task their dwarves to surround their farms with a gated fence to protect them from hungry deer. 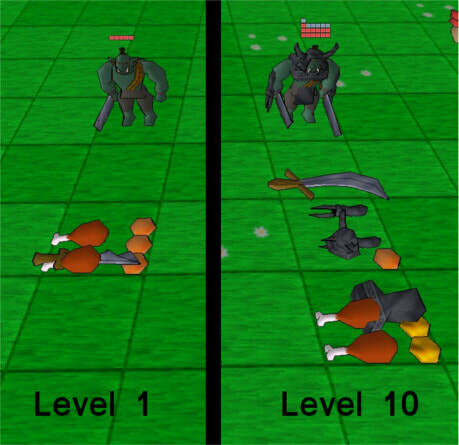 Little did I realize however that the deer still used the same code as monsters for movement, which included the ability to break down doors and gates for siege play. So I go to test the fence code and watch as a deer casually walks up to the gate and proceeds to tare it down in one kick! He then proceeds to help himself to his fill of crops and then casually walks out over the wooden splinters that remain of the destroyed gate. Unexpected emergent behavior like this is great fun. I'll leave you with a picture of another deer flexing his (unintended) ale drinking code. Follow me on twitter to see my latest screen shots. Construction is a major aspect of Lord of Dwarves. It serves two major purposes. Firstly it is a major creative outlet. Gathering resources and creating a structure from your imagination is a very rewarding process. 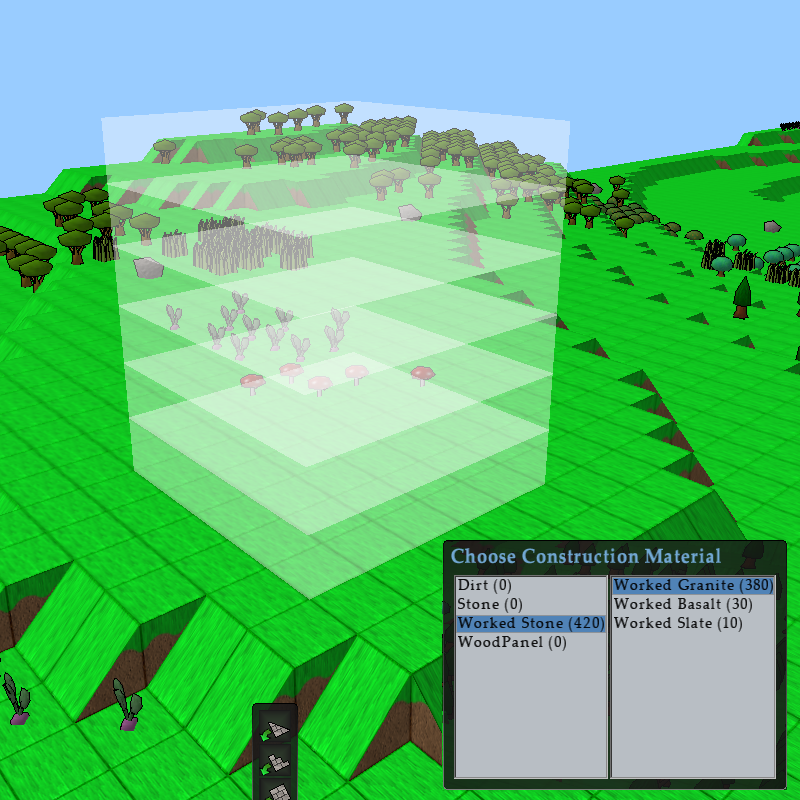 Secondly constructions serve as practical features in the game world. Be it a bridge to allow your dwarves quicker access to resources or a castle to keep the monster hoards out, construction is a fundamental part of Lord of Dwarves. As construction is so fundamental the interface must be easy and intuitive. What follows is a picture story of how to build a watch tower. Choose a spot to build your watch tower. Select the type of material to use. In this case "Worked Granite". Then define the area to construct the watch tower. Sit back and watch as the dwarves do the majority of the work! 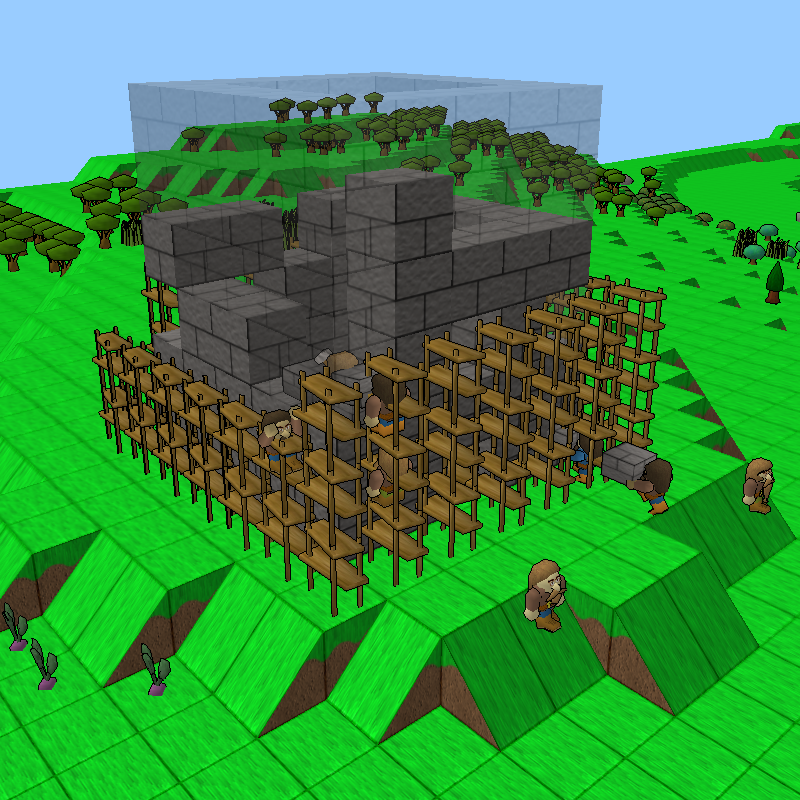 The dwarves can use scaffolding and ladders to reach places normally inaccessible to them. ...and we have a finished watch tower! 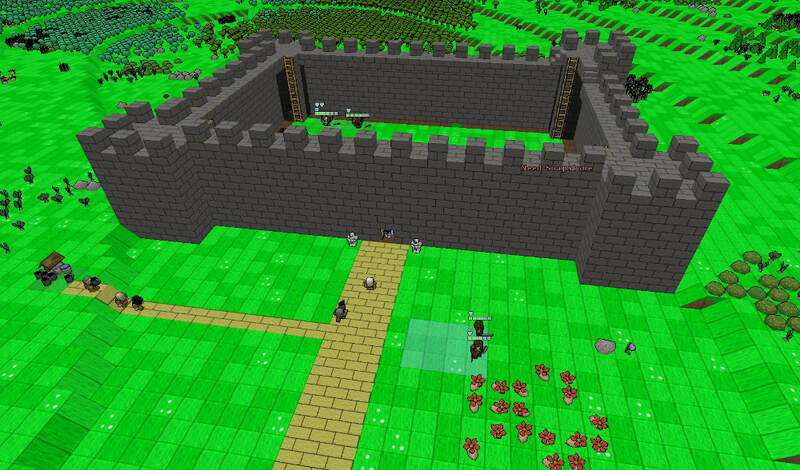 Man the walls with soldiers, place archers to fire at invaders, or keep building ever bigger structures! 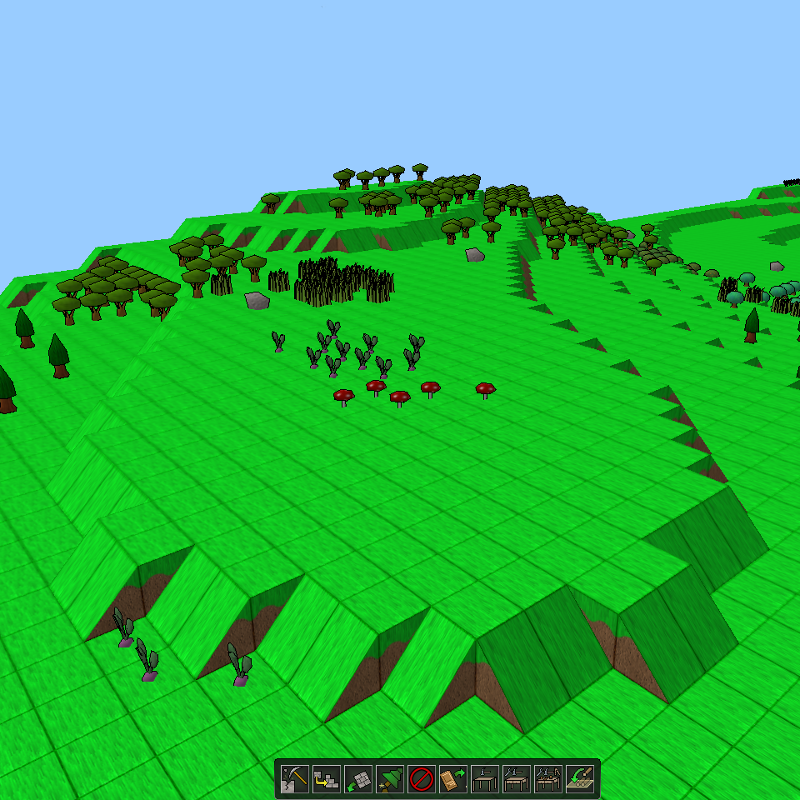 Lord of Dwarves provides a fully constructable/destructible 3D block world that allows you to build whatever you can imagine. I started programming Lord of Dwarves like so many other hobby projects - on a whim and without a clear image of where I was going. I worked on it in my spare time for a week, then two weeks, figuring I might stop at any time. Soon 8 months had passed and I noticed that writing this game become my preferred free time activity. It was a nice feeling to be so interested in making this game that I chose to work on it rather that playing video games. I've been working on it for 15 months now and my passion is as strong as ever. I think about it all the time and constantly want to get back to working on it. Lord of Dwarves was born of two games that I highly respect but have never played. The first game is Dwarf Fortress. For those who don't know Dwarf Fortress is a city management and resource gathering game with invading armies. I've watched many a Dwarf Fortress let's play and anyone who is familiar with it will know it's depth and complexity are something to be admired. It is obvious that an astounding amount of effort has gone into game features, world history, AI, even attention player accomplishment. However in all it's years of development practically no effort has gone into it's interface. I'm especially picky about interfaces. One of my pet peeves is lack of keyboard short cuts for frequently used actions. I'm looking at you 4X strategy games. If each turn half a dozen messages pop up on the right of my screen and I have to click each message just to pop up a dialog in the center of the screen, move the mouse over, dismiss the pop up, and then move the mouse back over to the next message - it's so painful. Seriously just map the messages and the dismiss button to the 'enter' key. I could do in 10 seconds what takes a minute to do. I've literally stopped playing games cause their interface slows it down so much. And it's unfortunate because these games are not bad. Often the game play is great - as is the case with Dwarf Fortress. But I know my personal limit and I have little time for poor interfaces. The second game is Minecraft. Sometimes I go to images.google.com and type in "Minecraft" and a random thing. Like just right now I typed "Minecraft Lord of the Rings". Holy cow! I can't believe the stuff people have created. It's amazing! But despite the fact that I love the creations, that I think the resource gathering and tiered crafting systems look like tons of fun, I've never played it. I know what type of gamer I am. I'm an achiever. I want to overcome obstacles. If I build a castle I want to man it with soldiers and see how it stands against a siege. I want to improve my design so that next time the attackers don't get quite so far. This is why I started building Lord of Dwarves. I wanted to play a game with the unit management, resource gathering, and invasion mechanics from Dwarf Fortress, but with an interface that wasn't a pain. I also wanted the totally customizable 3D world that Minecraft offered, but with meaningful enemies that could challenge the constructs that I created. I'm happy to say that things are coming along nicely. Many core engine components are already completed. And I look forward to the day when I have a playable demo for everyone. Nick Matyas has been programming games as a hobby for over 20 years. One day in 2013 Nick sat down on to start another hobby project. Three years later he has an expansive, fun, playable game!